For anyone with interest in electric vehicles, especially drives and control systems for EV’s, the Endless-Sphere forum is the place to frequent. It’s full of some amazing projects covering electric skateboards to cars and everything in between. [Marcos Chaparro] recently posted details of his controller project — the VESC-controller, an open source controller capable of driving motors up to 200 hp. [Marcos]’s controller is a fork of the VESC by [Benjamin Vedder] who has an almost cult following among the forum for “creating something that all DIY electric skateboard builders have been longing for, an open source, highly programmable, high voltage, reliable speed controller to use in DIY eboard projects”. We’ve covered several VESC projects here at Hackaday. While [Vedder]’s controller is aimed at low power applications such as skate board motors, [Marcos]’s version amps it up several notches. It uses 600 V 600 A IGBT modules and 460 A current sensors capable of powering BLDC motors up to 150 kW. Since the control logic is seperated from the gate drivers and IGBT’s, it’s possible to adapt it for high power applications. All design files are available on the Github repository. The feature list of this amazing build is so long, it’s best to head over to the forum to check out the nitty-gritty details. And [Marcos] is already thinking about removing all the analog sensing in favour of using voltage and current sensors with digital outputs for the next revision. He reckons using a FPGA plus flash memory can replace a big chunk of the analog parts from the bill of materials. This would eliminate tolerance, drift and noise issues associated with the analog parts. [Marcos] is also working on refining a reference design for a power interface board that includes gate drivers, power mosfets, DC link and differential voltage/current sensing. Design files for this interface board are available from his GitHub repo too. According to [Marcos], with better sensors and a beefier power stage, the same control board should work for motors in excess of 500 hp. Check out the video after the break showing the VESC-controller being put through its paces for an initial trial. 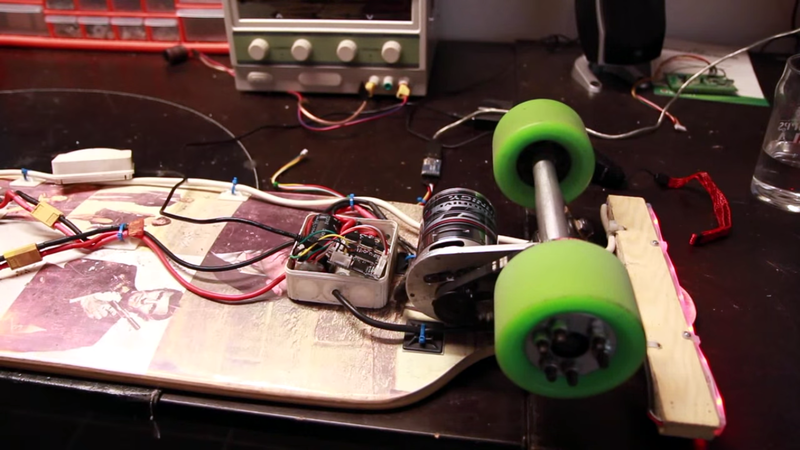 We love [lolomolo]’s Open Source electric longboard project. Why? Because he completely re-engineered everything while working on the project all through college. He tackled each challenge, be it electronic or mechanical as it came, and ended up making everything himself. The 48″ x 13″ deck is a rather unique construction utilizing carbon fiber and Baltic birch. In testing the deck, [lolomol] found the deflection was less than an inch with 500 lbs. on the other end. He modified the Caliber II trucks to add four 2250W Turnigy Aerodrive brushless outrunners driving the wheels with the help of belts. The motors are controlled by VESC, an Open Source speed controller. 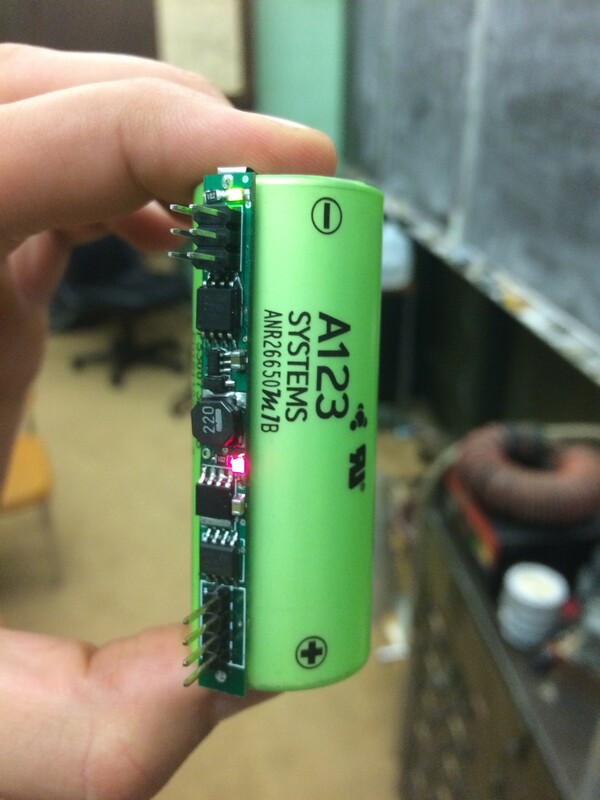 There are a lot of fun details, like the A123 lithium cells equipped with custom battery management system PCBs. The board sports 5W RGBW headlights that are so bright he can only run them at 10% PWM, plus RGB LED underlighting. All of it is controlled by an onboard Linux box. You can check out [lolomolo]’s GitHub repository for code, schematics, and CAD files. His Instructable for this project also has more design notes and thoughts. If sweet longboards are your bag, check out the 3D-printed longboard and the long-distance electric longboard we published previously. Brushless motors are everywhere now. From RC planes to CNC machines, if you need a lot of power to spin something really fast, you’re probably going to use a brushless motor. A brushless motor requires a motor controller, and for most of us, this means cheap Electronic Speed Controllers (ESC) from a warehouse in China. [Ben] had a better idea: build his own ESC. He’s been working on this project for a while, and he’s polishing the design to implement a very cool feature – position control. We’ve seen [Ben]’s work on his custom, homebrew ESC before. It is, by any measure, a work of art. It’s capable of driving brushless and brushed motors with a powerful STM32F4 microcontroller running ChibiOS that’s able to communicate with other microcontrollers through I2C, UART, and CAN bus. If you want to build anything with a motor – from a CNC machine to an RC helicopter to an electric long board – this is the motor controller for you. [Ben]’s latest update considers position encoders. Knowing how fast a motor is turning is very important to knowing how fast a wheel is turning, how much torque the motor is generating, and an awesome step in building the finest motor controller ever made. Like the last update, [Ben] demonstrates the great control program written for this ESC. This GUI programs the microcontroller on the controller, with protection from high and low voltages and currents, high RPMs, duty cycle changes, and support for regenerative braking. Thanks [Dudelbert] for sending this one in. For electric and remote control vehicles – from quadcopters to electric longboards – the brains of the outfit is the Electronic Speed Controller (ESC). The ESC is just a device that drives a brushless motor in response to a servo signal, but in that simplicity is a lot of technology. For the last few months, [Ben] has been working on a completely open source ESC, and now he’s riding around on an electric longboard that’s powered by drivers created with his own hands. The ESC [Ben] made is built around the STM32F4, a powerful ARM microcontroller that’s able to do a lot of computation in a small package. The firmware is based on ChibiOS, and there’s a USB port for connection to a sensible desktop-bound UI for adjusting parameters. While most hobby ESCs are essentially black boxes shipped from China, there is a significant number of high performance RC pilots that modify the firmware on these devices. While these new firmwares do increase the performance and response of off-the-shelf ESCs, building a new ESC from scratch opens up a lot of doors. [Ben]’s ESC can be controlled through I2C, a UART, or even a CAN bus, greatly opening up the potential for interesting electronic flying machines. Even for ground-based vehicles, this ESC supports regenerative braking, sensor-driven operation, and on-board odometry. While this isn’t an ESC for tiny racing quadcopters (it’s complete overkill for that task) this is a very nice ESC for bigger ground-based electric vehicles and larger aerial camera platforms. It’s something that could even be used to drive a small CNC mill, and certainly one of the most interesting pieces of open source hardware we’ve seen in a long time. Yann Guidon / YGDES has updated the log for Mains protection box.